Tuesday, April 18, 2017, 7:00 – 9:00 p.m. Please join us for two 15 minute presentations followed by discussion. Kara Uzelman will present a new work, ‘Where the Necessary Tools Do Not Exist, the Thoughts in Question are Not Expressed and Not Even Conceived’. Inspired by a summer field-trip to an abandoned brick plant, this work continues an undisciplined line of inquiry into the history and folklore around the Saskatchewan LSD experiments and their association with the rise of socialised medical care in the province during the first half of the cold war. Uzelman will discuss this work in relation to themes and questions around place, alternate platforms, audience, experimentation, framing, networks of exchange, and the opportunities and challenges of living and working in remote settings. During the academic year 2009-2010 Ward was the Artist in Residence at Langara College, wherein she commenced The Pavilion project, a 22’ geodesic dome serving as a catalyst for artistic experimentation involving artists, writers, designers and Langara College students. The Pavilion has since been moved to rural Heffley Creek BC, where it is currently under construction as a long-term, life-as-art project, being performed in collaboration with artist Kevin Schmidt. 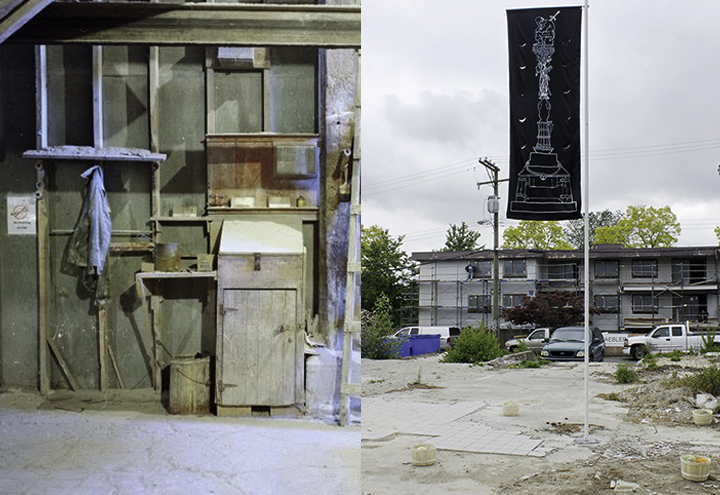 Image Credits: Right: Kara Uzelman, ‘Where the Necessary Tools Do Not Exist, the Thoughts in Question are Not Expressed and Not Even Conceived’, 2017; Left: Maegan Hill Carol: Holly Ward, ‘Monument to the Vanquished Peasants’, 2015.